Gone Fishin` accommodates up to 10 guests comfortably West side of house. Hot tub off of back deck. Spacious foyer. Open floor plan. Lot`s of room to roam. Lounge - nice, sunny southern exposure. Lounge is located off of the living room. Beautiful equipped kitchen. Great work space. Guests can keep the cook company. Dining room has deck hot tub too and back yard access. Plenty of counter seating too. Living room has television and propane fireplace. Master bedroom has king sized bed and deck access to hot tub. Hot tub located at west end of deck outside of Master bedroom. Attached, master bath has his and her sinks. ...shower and soaking tub as well. Guest bedroom one has queen bed. Guest bath with hallway access. Guest bedroom two has queen bed. Stairwell to upstairs sleeping lounge this is the 4th bedroom. Two futons to accommodate four people in the 4th bedroom/sleeping lounge. Television too. Upstairs lounge bathroom. Two car garage to keep out of the weather. Additional photos will be posted shortly. Get your fishin' gear together and make your way to McCall, Idaho. This cozy home furnished with a fun, fishing theme accommodates up to ten guests in comfort and style. Open floor plan lets guests gather round the fireplace or kitchen after a long day of play. Keep the cook company - plenty of counter space and seating to gather 'round and keep the conversation about the days adventures and the details of your fish tales going. 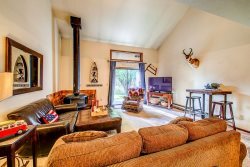 Get all of your play time in - this home is just minutes from back country access (Warren Wagon Rd), Green Gate snowmobile park, Bear Basin Nordic center, downtown McCall and less than 12 miles to Brundage Mtn. ski lifts. * Please note that the adjacent lot is privately owned and not for parking trailers, toys or vehicles. ** Have more than 10 in your group? Book the sister cabin, "Gone Fishin' Again" that is located directly behind it. Within 1 mile of Warren Wagon Rd. Everyone we talked to was very friendly, helpful, cooperative and responsive. We very much appreciated that. The driveway seemed to get plowed each time we requested it and "Lonnie's son" even showed up one time to shovel the front walk. This was unexpected but appreciated. We were a little surprised that he did not come with a snow blower but a shovel works too and we did use the snow shovel that was provided to shovel the walk several times ourselves. Thank you so very much for being so easy and enjoyable to work with. It is appreciated! Absolutely fantastic place. Communication was very easy and we will be doing it again soon. Very quiet, the warmth of the home , easy access to downtown. We love it Guest came from Bellingham, Bandon , Boise, and San Antonio. Everyone we talked with was efficient, knowledgable, friendly and very easy to work with. The house needs a wine opener that works. It would also be nice if the house had a coffee grinder. We have our own but most people don't and fresh ground coffee is a big plus in the morning. McCall is a mile high city located at the north end of Long Valley in Valley County, Idaho. We are surrounded by the Payette National Forest and enjoy access in all directions. The City of McCall surrounded by Mountains with the natural gem, Payette Lake, at their base allows vacationers countless opportunities to discover and explore the outdoors. Surrounded by the Payette National Forests, visitors enjoy access in all directions. Lake and river fishing, boating, downhill and nordic skiing, snowmobiling, hiking, biking or soaking at one of several hot springs in the area bring our guests back year after year all year long. Savor an alpine summer sunset from your balcony or deck or lakeside at Legacy Park. You're just five minutes from downtown McCall. A great location for Winter Carnival. If you're a skating enthusiast - Hockey, public skating and McCall Starz on Ice! venues are just minutes away at the Manchester Ice & Event Centre as well as fun shopping and great meal venues.